After making a simple zero clearance insert with my new Shapeoko 3 XXL, I wanted to try something else fairly simple but slightly more challenging. 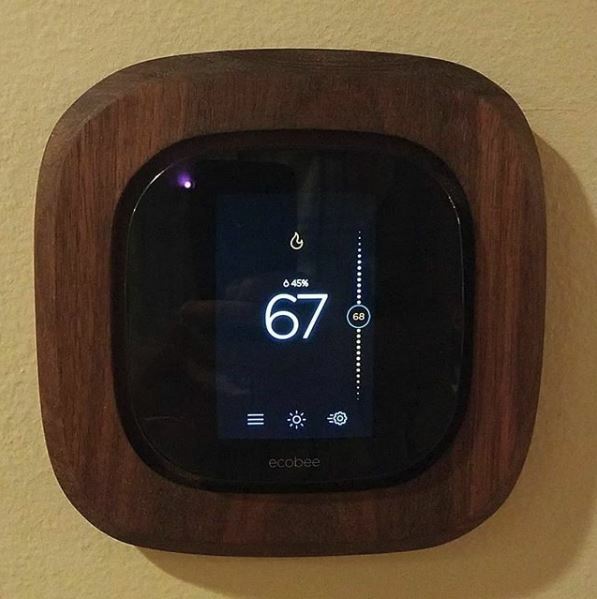 Ever since I installed our Ecobee 3, I’ve wanted to replace the white plastic plate that goes around the thermostat. But building something that has a nice shape and fits well would be a challenge so I dropped it in my “if I ever get a CNC” project list. To get started, I grabbed a photo of my model online (there are a lot of slight variations through the years!) and traced around the outside in Inkscape. I used some cheap 1/4″ MDF as test pieces on the Shapeoko and after 4 attempts with tweaks in between, I had a good fit around the thermostat. Then I added a lot more complexity. Instead of just being cut out, that original hole that I designed became a pocket in the material. I added in a hole all the way through the back for the wires and two more for the mounting screws to pass through. That all went pretty smoothly but the tricky part was making room for the vent on the bottom of the thermostat to exhaust air but not making the vent bigger than it needed to be. I’m still not convinced I have that designed as well as I could, but it got to the “good enough” point after 4 attempts in 3/4″ pine. For the final cut, I milled up some walnut and put it on the CNC. The first attempt went ok but ended up failing near the end. Despite slowing down the program to account for hardwood, I think I was still a little too aggressive and I might have had the router carriage adjusted a little too loosely. The second attempt went slower (about 35 minutes instead of 20 minutes in pine) but it came out perfectly. I finished up with some sanding and routed a chamfer around the outside using the router table. I finished it with a coat of boiled linseed oil and mounted it on the wall. This project really made me feel the value of the CNC. It was awesome to tweak my design by fractions of an inch and have a completely new part in under half an hour. It’s a lot easier to experiment than if I was trying to do this all carefully by hand. Fun fact: about 80% of the way through this project, I was installing a test plate and when I put the thermostat on, it didn’t turn on. Of course this was the last thing I was doing before going to bed. After some panic and opening up service panels on my furnace, I found a fuse that had blown. The next morning, I called my favorite HVAC expert, and verified that replacing the fuse would work. After a quick trip to the store and $2, I was back in action, but boy was that a cold and stressful night! Always turn off your equipment before working on it! When Tyla’s dad was in the Navy, he served on the USS Hector fixing clocks. 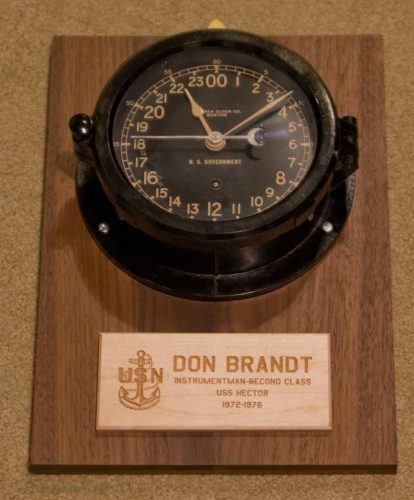 He ended up with one of the clocks from the ship and for his birthday this year, the kids got it fixed up and running again. It sat on a counter in their house until I snagged it and mounted it for his Christmas gift. I was able to make it with some scrap walnut and maple, but just barely. After I had it all done I realized that I should include a place to hold the winding key. It was kind of hard to work that into the design so I carved out a spot on the top where it can rest. I took the piece of maple to work to use the laser engraver there. The clock has two keyhole mounts routed into the back so hopefully that will be enough to hold the heavy clock onto the wall. 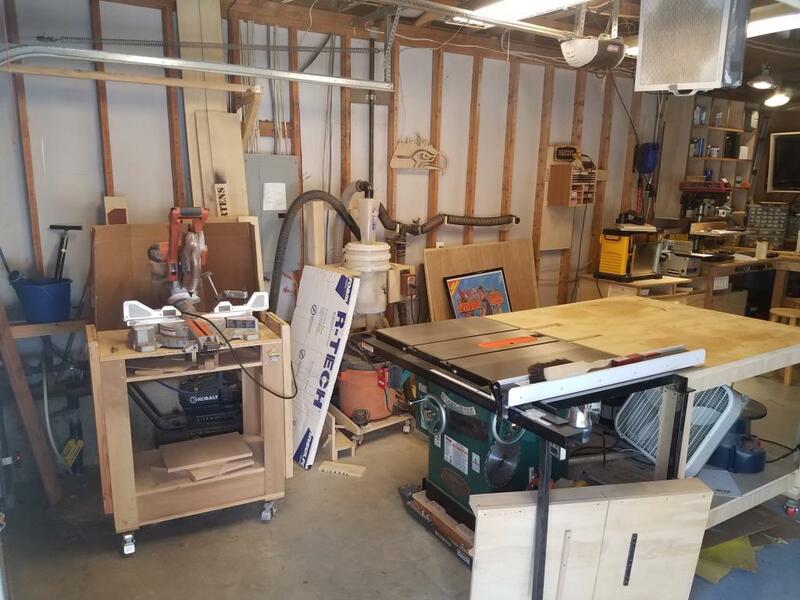 My woodshop is the third bay of our garage so I basically have one long wall to work with. It has always been a catch-all spot where I storage random sheets of plywood and generally dream of what might go there some day. It was time to stop dreaming and make use of it. I find that in my workshop I repeatedly get stuck in indecision. It’s silly because I will be making it all myself and I can just change it later if I decide I want to. Pick a path and go for it! I saved some money by not building actual individual cabinets but rather each cabinet shares a wall with the one next to it. 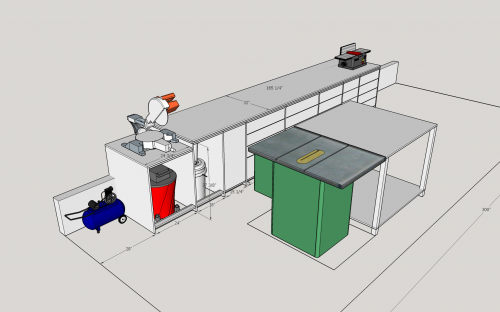 It was going to be a LOT of plywood, so I started by drawing the whole thing out in Sketchup, figuring out what pieces I’d need to cut and then I used a free cut list generator to help me optimize my plywood usage. Part of the plan was to make a more permanent place for my miter saw to sit. The cart that I built in 2015 has been working great, but I’m tired of having it be in the way. With this new plan, the miter saw sits lower than the other cabinets so that wood rests flat across the saw onto the top of the cabinets. At some point I’ll put some T-track into the top of the cabinets to add a stop block with a tape measure for quick, accurate cuts on the miter saw. Normally you see these built with outfeed support on both sides, but I don’t have enough room for that. And while I’d prefer to have the outfeed support on the left side, this made more sense. The garage door is on the left so if I have to cut a really long piece, I can open up the door and get some extra room. I used 3/4″ pine plywood (~$35/sheet at Home Depot). I’ve used that for most of my shop projects and I’m always impressed at how nice it is for the price. The tops of the cabinets got two sheets of the plywood. It adds a bit of cost but it really strengthens the top and makes the cabinets feel more solid. The first step was cutting each of the vertical pieces. 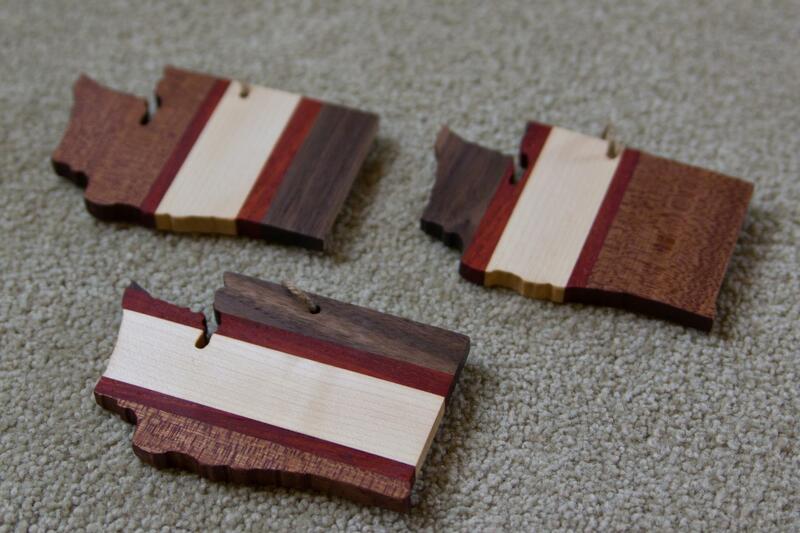 These were basically just rectangles with a notch cut out for a toe kick, but there were two complications. First of all, I had to cut out a notch for the foundation wall. Secondly, the garage floor isn’t level. I wanted to spend a little extra time to make the top work surface be level to avoid hassle with the drawers later. So each of the vertical pieces was going to be a slightly different height. Instead of trying to get that perfect, I left each one about an inch short. 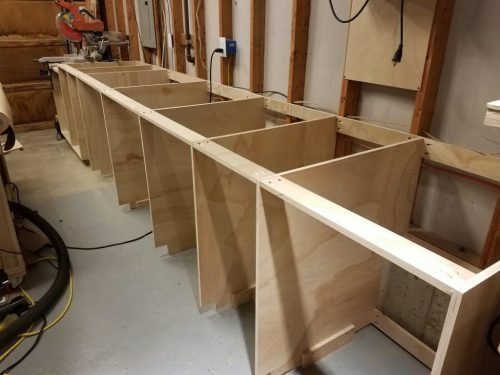 Then when it came time to mount them in place, I would hold them at the right height, slide a piece of scrap plywood up next to the bottom and screw the scrap into the vertical divider. So the cabinets are screwed into the studs and then rest on the floor. I don’t know if I’d do it this way again or not, but to space out the vertical dividers, I cut a bunch of pieces the with of the cabinet and pocket holed them into the dividers. On the plus side, it made it easy to assemble each section one by one and keep them all evenly spaced, but on the down side, it was a lot of screwing and cutting. You’ll see that not every opening is the same width. I went with 3″ multiples since that’s what normal cabinets use, but I tried to add in some variety for storing different things. After adding the top (YAY! Finally a place to put some tools! ), I ripped down some 2x4s to make a face frame. Hiding the plywood edges looks nice but it also helped me make perfectly rectangular openings which pays dividends down the road when it’s time for drawers. 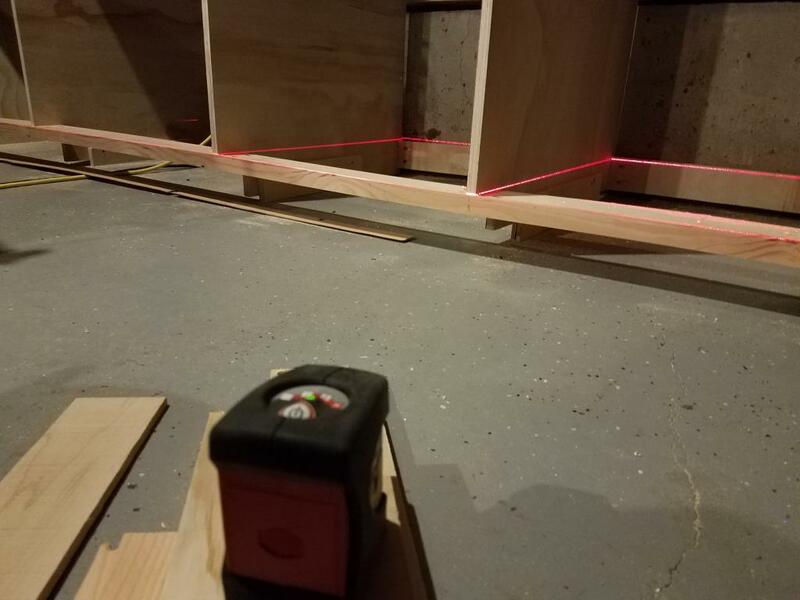 The laser level was instrumental in getting the top of the cabinets level and also at this point in the process when I was making the dividers perfectly vertical and the horizontal face frames perfectly flat. Now it was time to make the drawers. A LOT of drawers. 20 to be exact. Again, I probably could have gone an easier route, but I chose to assemble the drawers by using dadoes. This gives a bit of additional glue surface and helps to keep things square during assembly. Unfortunately my little shop vac can’t handle the dust collection duties for dadoes so it repeatedly slogged up the hose inside my table saw. I finally just gave up on dust collection with the dadoes, disconnected everything, and cleaned up afterwards. Most of the drawer sizes were pretty standard, but there were two special ones. One of them is full height and my plan is to use that for scrap hardwood storage. I have a bunch of smallish pieces and I had previously been standing them up in a trash can. The other one holds my planer. That planer is pretty heavy so I ended up using a double set of drawer slides which seems to be working well so far. If it starts to sag I can always kick a block under the end of the extended drawer when I’m using the planer. 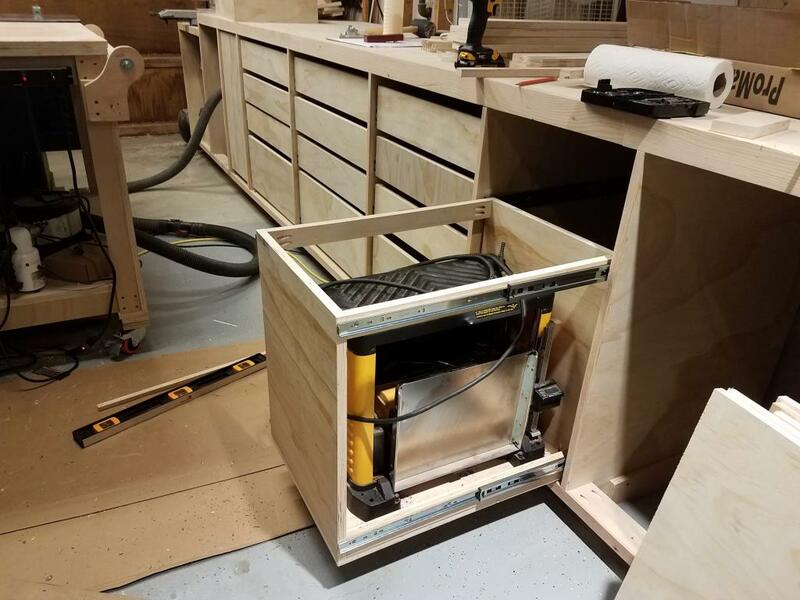 I don’t know how well both of these special drawers will work in the long run, but it’s easy enough to take them out and add standard drawers later. Speaking of drawer slides, that part of the project can really break the bank. I have bought some very cheap slides from Amazon in the past and had good success so I went that route again. This time I got Promark full extension slides along with some mounting screws. After the above photo, I finished off the last six drawers and now it’s fully functional. I moved on to some other projects, but soon I will add drawer fronts. Those will help to hide the uneven spacing of the actual drawers and bring them up flush with the face frames. I’m planning to design and cut some drawer pulls on my new CNC machine as well. This was a huge project and it was a pain breaking down 13 sheets of plywood, but man I’m loving it! I have a huge new work surface and so much storage. Building drawers takes a lot of extra time and money, but I find that they are a lot better than deep shelves because you can actually use the whole depth instead of forgetting what’s behind the first row of stuff. 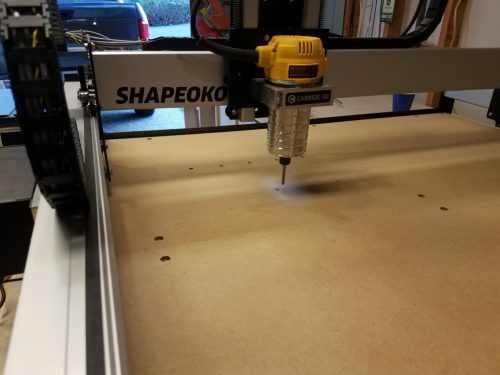 After years of hemming and hawing, I jumped on the Shapeoko Black Friday deal this year. It took me a while to get around to unboxing and assembling it because I was finishing up some Christmas gifts, but now that I’ve gotten started on my CNC journey, I want to share some thoughts. Cost – There’s no getting around the fact that this is expensive. I mean, this is a high tech piece of equipment that would have been completely out my grasp 10 years ago, but I think the cost part that bothers me is that this isn’t going to hold it’s value like a table saw. This is a point-in-time snapshot of technology and new models will continue to outpace what I have today. Most of my hobbies have a point where I spend a bunch of money on something fancy and then lose interest and kind of regret my big purchased. I’m really hoping that this CNC purchase isn’t that point for woodworking. Size – I went for the XXL version, which, as the name implies, is the biggest one they sell. The cutting area of the smallest one is 16″x16″ but my version is 33″x33″. I still haven’t decided if that was a good move or not. It’s huge and my shop is not. I’m starting to feel better about the choice now that I’ve built a shelf that flips up against the wall. 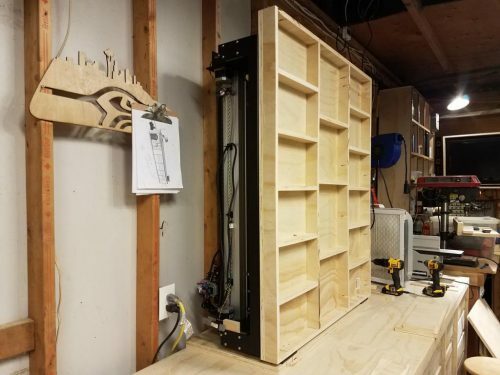 Storing it vertically is probably not idea in terms of fine tuning the machine, but there aren’t a lot of good options available in my small shop. It’s a beast to raise and lower though. I think the whole machine and table probably way at least 120 pounds. Complexity – While setup of this machine is dramatically easier than something like an XCarve, it’s still not a turn-key solution (that’s one of the reasons why it’s cheaper than other options.) The time from purchase to first success is a LOT longer than any other tool in my shop. I spent probably three or four hours getting it “set up” but that’s really only the start of the journey. Want a way to hold down your material? You need to figure that out and implement it. Want to make sure your bed is flat? You can create a job to do that but you oh wait, if your spindle isn’t perfectly square to your bed you won’t have good results. Want to make sure your spindle is square to your bed? Build or buy a tramming device and spend a long time shimming and tweaking. And even once you plow through all of that, you need to get familiar with the software and spend a good chunk of time drawing out your design using vector art on the computer, setting up the correct tool path for the machine, getting your feed rate correct so you don’t cut off a bit, etc. As I’m going through all of this, I kept comparing it to my table saw upgrade which was in a similar price category. The table saw had a similar unboxing time requirement but then I was instantly more productive. That’s far from the case with a CNC machine. 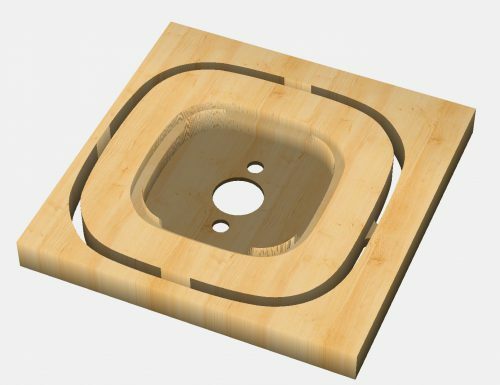 If you’re not up for a massive amount of learning and experimenting, CNC is not for you or rather, the DIY end of CNC isn’t for you. There are other products like the Nomad from the same company which are a much easier experience. With those tools, you can focus more of your effort on the programming/drawing side of things but you also pay for that privilege. As you can tell, I’m still nervous about whether this was a good purchase or not. One thing I realized is that every time I hit another step, I’d go online to try and learn from people who had gone before. That’s generally helpful but it can also be a quagmire of indecision as there are a ridiculous number of different ideas about how to do something that seems as simple as holding your work piece safely to the bed so it doesn’t fly off when the spindle touches it. I finally gave up on trying to do a “smarter” version of every single step and decided to just plow forward with something that seems good now. I’ll learn and redo things as I go. There’s just too much knowledge to ingest without some background experience. My first big step was drilling a bunch of holes into my waste board. I bought a pack of 50 threaded inserts from Amazon and drilled a pattern of holes all the way through the waste board. Then I installed the threaded inserts from the bottom of the waste board. Now I can use those as mounting points for hold down clamps (which I still need to fabricate.) A tutorial on the Shapeoko website was really helpful for that project and I’ll probably use their hold down clamp tutorial too. My first project is going to be a zero clearance insert for the table saw. I have a fancy one from Grizzly that works well for most cuts, but it’s nice to have the zero clearance inserts for the dado stack, angled cuts, etc. Once I have down the work to program it all on the CNC, I can whip out new ones very quickly and cheaply. This is kind of a silly project because I can make one by hand in probably 20 minutes or so, but it seemed like a useful project with a low level of difficulty before I jump into something more complex like making a sign.